Well, I finally did a wall panel. I'm not sure I'm all that crazy about he results. These haven't been sanded or shaped to fit together, or glued, painted, etc. (they are just stacked in the picture). Those things might help, but I'm not sure about continuing with this idea. Still, I'll probably cast a few more of these and remove some of the 'window glass', just so I can make at least one 12"x12 or 24" building ruin. the Imperial Strongpoint (box set contains one Imperial Strongpoint, including two plastic Bastions and three plastic Aegis Defence Lines). I guess it just depends on the type of battlefield you're going for...obviously they pushed one for Cities of Death and one for Planetstrike. The Strongpoint does come with some cool weapons bits...not sure if they would come into play in a normal (non-Apocalypse) game though. Wow, I'm acutally impressed. I had to enlarge the photos to see any "flaws." Even then, I love the rough texture; it looks aged. The only problem might be the joints, but I'll bet rigorous sanding, mortaring (is that a word? ), followed by more sanding would clear that up. Also, we could shlack the whole thing before basecoating. Of course, that could prove time intensive. We should run a cost analysis and compare this product to what we can do with resin. Honestly, I'd be happy cranking out a lot of the putty terrain as "first drafts" and then after feild testing a variety of types, upgrading the pieces that play well. I'll tell you one kind of terrain I want to see more of: Ruins. 1) you can't blow them up, and 2) if I place an objective in a ruin on an upper level, an fast vehicle can't swoop in on the last turn and contest it. gtg. more later. Nice building, though! Thanks. Yeah, I think that a sanding, gluing, and chink mortaring will help. I also think that just a single wash of a darker color on this could make it look a lot cooler. I like the look of ruins, and I'm pretty sure I'll like the way they play. Probably 80% of my structures will be ruins. That is one good thing about the current product...they are so cheap to make, I have no qualms over breaking a finished piece up (useful rubble too). That said, I think one bastion for $29.75 would fit our games better right now and be fun. Looking through the imperial selections, we already have a manufactorum of course. If we had a second, can the pieces be used together to build higher? Right now my first pick is the Basilica Administratum, because it looks like it can have a definite 4th level, which is terrain that helps a foot-army. Of course, the Shine of the Aquilla looks pretty cool, and I'm not sure our casting is ever going to get the intricate. Btw, I don't see "additional pieces" for a building. Were you just suggesting buy the boxes and mixing, matching, (replicating) panels? I read the YTTH article. While he might be right, I'm just not there yet. While I'd like to eventually play in tourneys, I'm not really in this for competition. I'm still in the "Hey this is a cool looking mini and I want to play it on the table" stage. Of course I would like to win, but oddly enough for one as introverted as me, when I play the game I kind of just want the social element that goes with getting my toys out with a friend and playing. (and to just shuffle some cool stuff around) It sounds like the guy is no longer happily playing ball in the sandlot, but rather trying to squeeze everything he can out of his pro career before he blows out his knee. Also, as we talked about before, a player with a mech list is as capable of making mistakes as he is with any other list. The list is important, but the general even more so. Everything can be exploited. About the terrain, I had some more thoughts that are generally in line with yours. 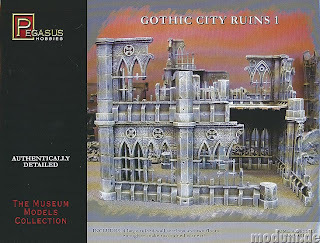 The Imperial sector I mentioned is a box GW used to sell, up until very recently actually, that contained one of each of the COD Ruins, plus extra components that could be used to build a 4th building. It's still available from The Warstore. And yeah, all these panels can be mixed and matched, so another manufactorum box could be added to yours for a bigger one. 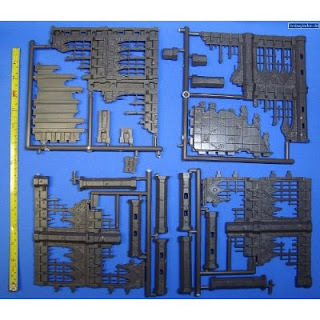 If I buy anything, it'll be something like these, because my thought was that the putty might be very well suited to making bastion type structures, and yeah, barricades too. Good coments. There is certainly a lot of room in this hobby to enjoy it however you like. Personally, I'm pretty excited about the modeling talents you're bringing to the table. Oh, and YTTH is on kind of an extreme end. (Maybe off the deep end?) Most the people I run into around the table are really pleasant and accepting of where ever a person is. Yeah, I read all these blogs that talk about how tanks should stretch a line and attack at a weak point. It's not that hard to defend against that. And like you said, anything can be exploited. More vehicles just means fewer things I have to disable/kill before I take your objectives. Yeah, tanks die hard, but it's not rocket science...well wait, I guess it can be if you have a launcher! Anyway, the point I thought that article had for your army was how useful a tac squad in a Rhino was compared to an assault squad. It is kind of cool that you can drive 12" +exit 3" +shoot 12 with bolters= hurt someone 27" away. (or instead of shooting you could run into cover so that if YOU get assualted, you'll still go first at a higher initiative.) Yeah, the tac squad is not your Close Combat specialists, but they are tough enough to lock up a squad until the "slower", CC element catches up (assault squad, termies, whatever.) Or just having that bolter fire soften up the enemy before sending in your CC specialist is nice, plus your rhino and squad are providing 4+ intervening model cover for whoever is following. Anyway, I'll have to look up the Imperial Sector. If there is a decent discount...Hmmmn. I enjoyed seeing the terrain in person. I also enjoyed our game. Not sure if we met our goal for speeding up our play, but it was a lot of fun. Thanks also for the beer and pizza; I'll quartermaster our next war!